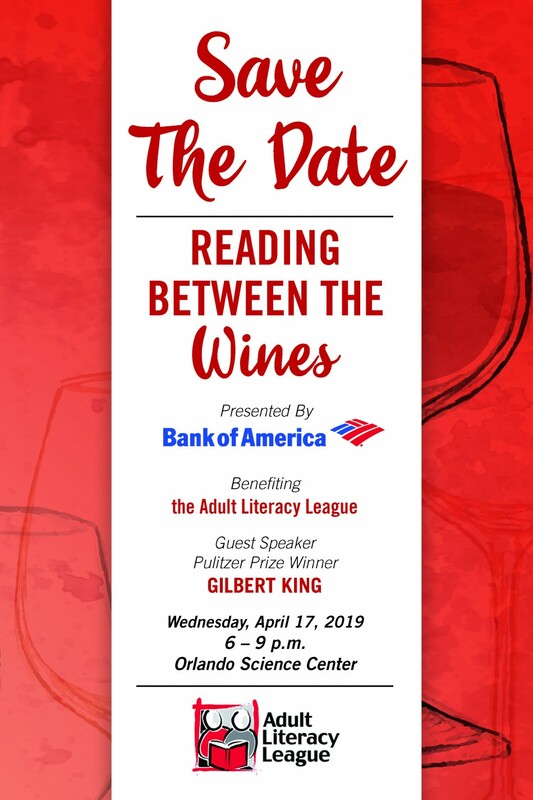 Join us for an evening of fine wine, great food, incredible silent auction, and compelling conversation with Pulitzer Prize winning author Gilbert King. This year’s event will take place on Wednesday, April 17th, 2019 from 6-9 p.m. at the Orlando Science Center (777 E. Princeton Street, Orlando). All the funds raised at Reading Between the Wines are vital in allowing us to keep our services free of charge which include classes, one-to-one tutoring, GED prep and testing, providing books and materials to the participants in our Family Literacy Program. We love having the opportunity to build lasting relationships with businesses and organizations in our community. With 1 in 5 adults in Central Florida reading at or below a 5th grade level, it is so important for us to maintain these relationships because all of our organizations are connected here. By supporting each other we’re working towards a stronger Central Florida.